What can I say, apparently my favorite anime show of Summer 2015 is the two minutes per week of literally just watching a woman eats, drinks, commentates, and lets out what is probably the most contented sigh you’ve ever heard in the history of moving pictures. 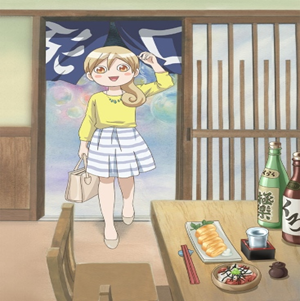 The entire premise of Wakako-zake is to have the titular character, an office lady in late 20s, acting as a tour guide into her headspace as she enjoys various kind of food by herself. You don’t need to be a big foodie or particularly interested in Japanese culinary to be able to appreciate the show; Wakako isn’t here to provide technical or detailed analysis on a given dish, but to express her enthusiasm as she muses on how each dish is being prepared, builds up her anticipation for the incoming dish, and finally gets to savor the taste of delicious food and its accompanying beverage after a hard day’s work. It’s simple, pleasant, and instantly relatable. Such is the nature of this one-woman show, the voice actress is probably the most important element in it. The renowned Miyuki Sawashiro certainly didn’t disappoint in that regard, lending a distinct tone to Wakako’s monologues, which is framed in such a way that it also felt like a natural conversation with the audience. In what is probably the most striking and memorable female voice acting to me since Izumi Kitta’s performance in WataMote, Sawashiro conveyed a significant amount of personality through Wakako’s mutterings alone—there’s a jaded and worn-out quality expected from your typical twenty-something daily grinder, but there’s also cute bursts of excitement, wonder, and joy whenever she’s talking about the food. And, of course, there’s The Sigh. Needless to say, don’t expect any drama or actual development. 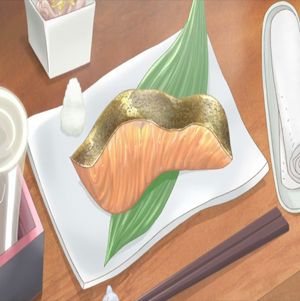 What are indeed there should reliably get you in the mood for what the show’s offering, though: the thirty-second opening jingle is catchy and fitting, the depiction of food (of which there’s a delightful variety) is mouth-watering, and even Wakako’s incongruous design should eventually become endearing. When I first read the synopsis, I thought there’s dark undercurrent about alcoholism and depression, but in reality (at least insofar as this adaptation goes) it’s a mostly pleasant watch highlighting the necessary self-indulgence in-between the daily grind of work. 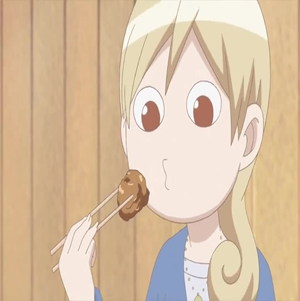 There’s a few glimpses of Wakako’s daily life intertwined with her philosophy on food, and while one may wish for more of that, the overall mood I got from her is the blissful savoring of solitude instead of wallowing in loneliness. I can dig that. 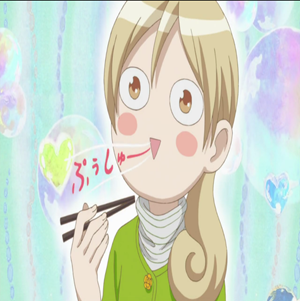 I obviously enjoyed Wakako-zake and would recommend it to everyone, except if you’re somehow deeply averse to the act of putting food inside your body or something like that. It’s very repetitive by nature, which probably means it’s not fit to be binge-watched, just like how you wouldn’t gorge yourself with fine food all at once. Wakako herself is someone I’d like to sit with and have something together, even if she’d call me a piranha and silently judging my food preferences, heh.